Credit: PHOTO CREDIT: Rob Cahill, UTHealth. When paramedics resuscitated cardiac arrest patients with a new type of breathing tube, their patients were more likely to survive, according to a University of Texas Health Science Center at Houston (UTHealth)-led study in today's JAMA. 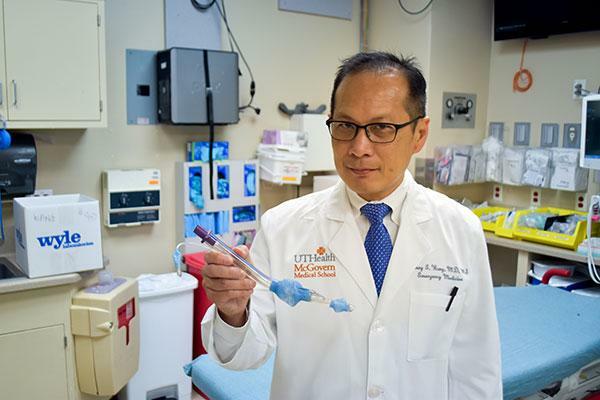 "Based upon these results, use of the newer, more flexible laryngeal breathing tube could result in thousands of saved lives every year," said lead author Henry E. Wang, M.D., M.S., professor and vice chair for research in the Department of Emergency Medicine at McGovern Medical School at UTHealth. "This is one of the first randomized trials to show that a paramedic airway intervention can improve cardiac arrest survival," said Wang, who described the study as a multicenter head-to-head comparison between the newer intubation tube and a traditional one. Funded by the National Heart, Lung, and Blood Institute (NHLBI), the study is the largest of its kind to test oxygen delivery methods used by firefighters, emergency medical technicians and paramedics. The research study – Pragmatic Airway Resuscitation Trial – compared survival rates among 3,000 adults with cardiac arrest treated by paramedic crews from 27 emergency medical services (EMS) agencies from December 2015 to November 2016. Approximately half received the newer laryngeal tube airway, while the other half received traditional endotracheal intubation. The study (NHLBI grant UH2/UH3-HL125163) was conducted by the Resuscitation Outcomes Consortium research network and included the Birmingham, Dallas-Fort Worth, Milwaukee, Pittsburgh and Portland communities. Overall, survival was higher in the new tube device group than the standard intubation group. With the new tube, 18.3 percent survived three days in the hospital, while in the intubation group, 15.4 percent survived three days. A total of 10.8 percent in the new tube group survived to leave the hospital, while 8.1 percent in the intubation group survived to leave the hospital. The proportion of patients surviving with good brain function was also higher for the new device than standard intubation. While additional research is needed to support the study's findings, the researchers believe that the benefits of the newer airway device are due to its easier technique, leading to better blood flow and oxygen delivery. They are continuing to analyze the data to gain additional insight into the study results.